Joanne Haywood is a leading studio jeweller, writer and educator. She has worked and exhibited in the U.K. and Internationally. She holds a BA (Hons) in Jewellery Design from Central Saint Martins and is recognised for her individual voice and skill in Mixed Media making. 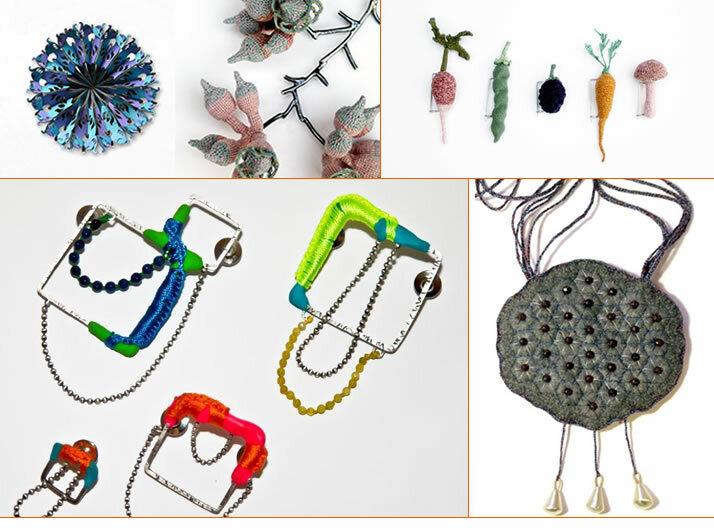 Joanne’s jewellery utilises both metal and textiles, and the techniques of crochet, stitch, felting and fusing, oxidising and forming. I do not set out to be a fashion or jewellery artist but as my portfolio developed and I became interested in both elements and aesthetics. I set up my workshop in 1983 after leaving the Royal College of Art. Although trained as a jeweller, my work has a strong textile influence; I am passionate about colour, pattern and technique: I love the making process and exploring the possibilities of non precious materials. Kathryn Partington creates beautiful pieces of highly individual and desirable jewellery to adorn, adore and be worn. Pieces are made using a range of diverse techniques born from training within the discipline of surface pattern, printed textiles, ceramic tableware design and jewellery. I am a contemporary jeweller using precious & non-precious materials combined with hand stitched silk threads, to make work inspired by aspects of the landscape I see around me while out running & walking. I am a London based contemporary jeweller from Geneva. I graduated from the Royal College of Art, London, with an MA in Goldsmithing, Silversmithing, Metalwork & Jewellery. I completed my BA(Hons) in Jewellery at the University of Art & Design, Geneva. I am a materials led practitioner. By working with materials with which there is no prior knowledge established, experimentation and chance are invited into the artistic process.